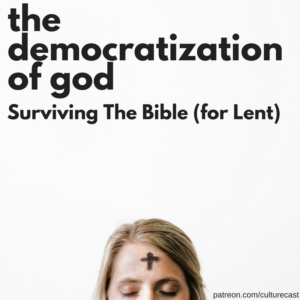 This week on the CultureCast we continue with highlights from the Surviving the Bible for Lent course. Tripp gives you your Bible-nerd fact of the day, you’ll hear about why David is like the Harvey Weinstein of the Hebrew Bible, what Mandy Moore has to do with the Psalms, and our avoidance of suffering. First up, Jeremiah 31:31-34. Tripp once again gives you many options for preaching this text: who has access to God in the new covenant? the tension between institutions and movements, the democratization of God, the deep political divisions latent in the passage, and how new life is stymied by needing to be right in that divide. In the Psalm (51:1-12) we see David’s internal struggle and our uncomfortability with God using someone like David for something good. For Hebrews 5:5-10, Tripp helps explain how the text can short-circuit latent penal-substitutionary atonement interpretations by noticing what it doesn’t say, how Jesus’ faithfulness helps re-frame our understanding of sin and salvation, and how Jesus changes the job description of high priest. Lastly, in John 12:20-33, Christian and Amy talk about our inability to recognize the truth right in front of us, the requirements of transformation, what is truly necessary to be born again, and hurting for the right reasons. Plus, Amy gives some advice and reasons for engaging in contemplative practices. And don’t forget you can enter to win some sweet new bibles from our friends at the Common English Bible.